Go get Mpow selfie stick now! NOT ONLY A SIMPLE SELFIE STICK: Not only want to take selfie, but also wanna take perfect group photoes while liberating hands? Our selfie stick Integrates monopod and tripod as one, with detachable bluetooth remote, can perfectly help take a photo in a 33ft distance. Fit to different situations like selfie, group photos or shoot video at travel, party, graduations, live, facetime,etc. GET SHOOTS WITH RECHARGEABLE REMOTE: You can remove the bluetooth remote shutter to capture pics, it pairs with most IOS/Android smartphones such as iPhone series, Galaxy series, Edge, Mote, Huawei, etc. With built-in 65mAh battery, can be full charged within 30 - 45 minutes. EXCELLENT IN BOTH LENGTH AND PORTABILITY: No worry about not being long enough! Extendable length from 6.7 inches to 26.3 inches, phone holder width max to 3.5in. It become a lightweight pocket size one when folded, carry it easily everywhere! 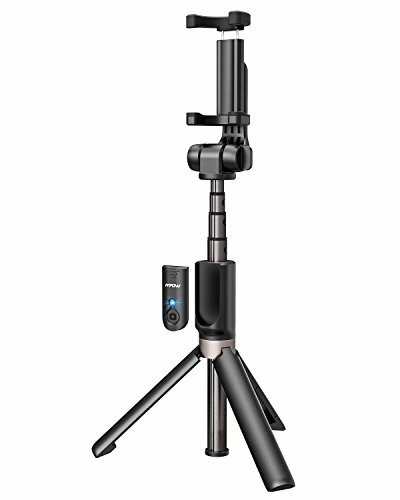 3 WAYS TO ROTATE, FIND BEST ANGLE FOR YOU: 360°clamp rotation to choose horizontal or vertical camera mode, 225°neck rotation & 360°head rotation to find your perfect shooting angle. combine its functions with amusement, greatly improved the function compared old version. WORRY FREE PURCHASE: Your satisfaction is our first goal. Every Mpow product includes a 45-day money back & 18- month warranty. Any further problem we will try our best to solve it for you.Just Enjoy a memorable selfie experience from now on!